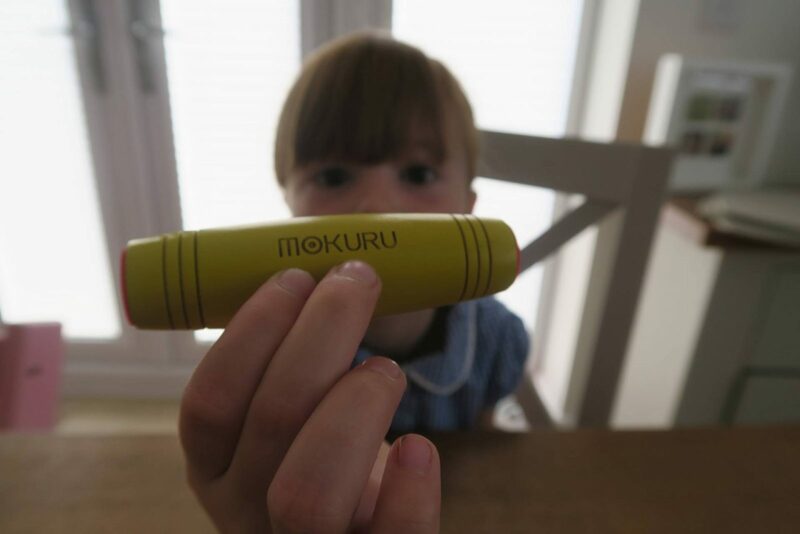 MOKURU…Is It The Next Big Fidget Toy? We were a bit slow to get into the latest craze of fidget toys, but now my girls love the fidget spinners and you can’t go anywhere without seeing a child with them. I do now keep them in my bag, as they are handy to grab out when we are in the car on a long journey or at the dentists. All those places where you need a quick and easy solution to entertain the children, they are great for. Well we are no longer behind with the latest craze about to take the UK by storm! 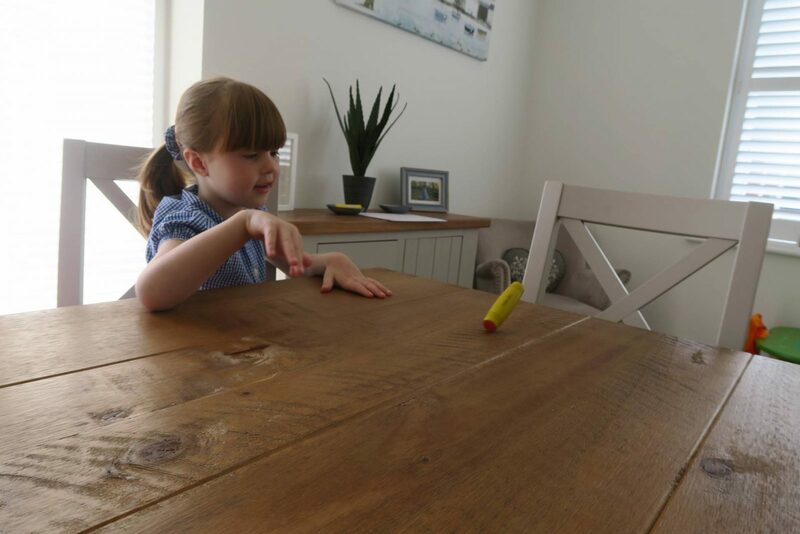 Today see’s the launch of a new toy that fits into the fidget market, called the MOKURU – The amazing desk toy. What is this I hear you ask? 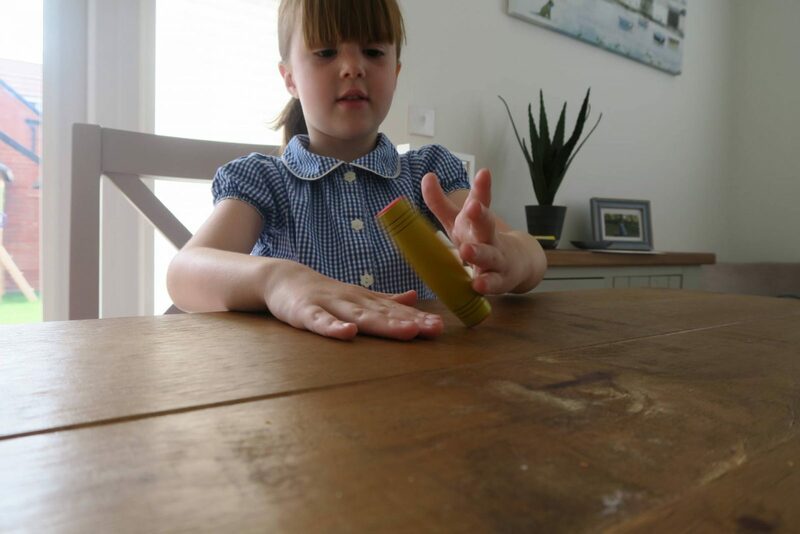 It’s the latest toy to arrive from Japan and it was originally designed to test an individual’s balance and focus – now this simple design is testing the dexterity of fast fingered flippers everywhere. It has been crafted from the best materials and designed into a cool shape that you can flip tip and spin one MOKURU or more. As with anything like this, there are always people that try to copy designs, and it’s worth mentioning that there are cheap copies of MOKURU, so be careful to make sure you have a genuine one that is going to do what it’s meant to. When I first saw it I wasn’t blown away and I didn’t quite know what to do with it. But trust me once you get going it’s very addictive. Alice was very intrigued by it, but we didn’t really know what to do if I’m honest. We headed over to YouTube and found a tutorial to show us some basic tricks and then as you master it there are more expert tricks to try. 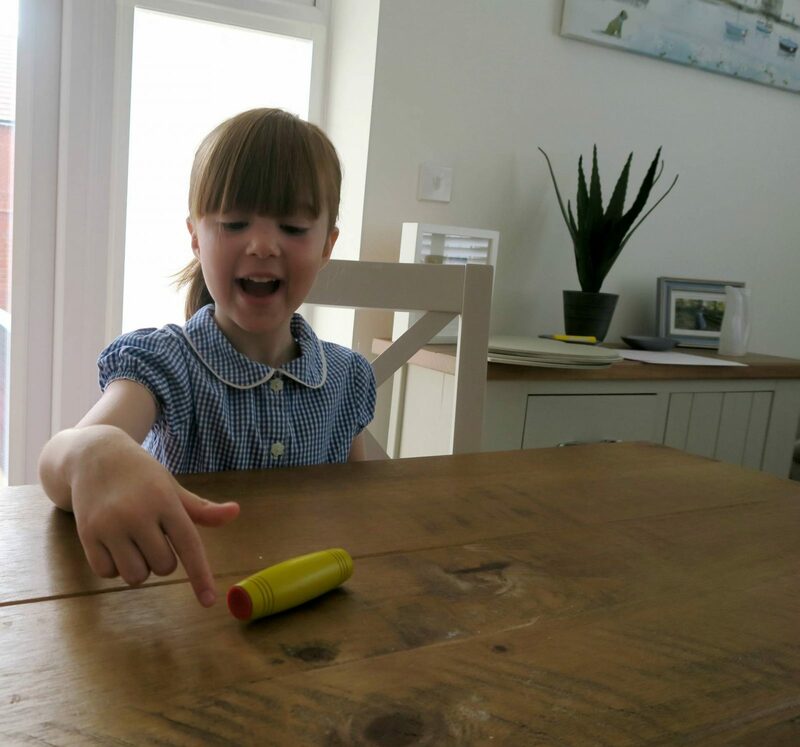 Alice had a go at getting it to ‘walk’ across the table. This took her a while to master and she still didn’t manage it every time. There is definitely a skill to being able to do it and it takes a lot of patience and practice. She took it really seriously and tried different ways to stand to get it to do it. 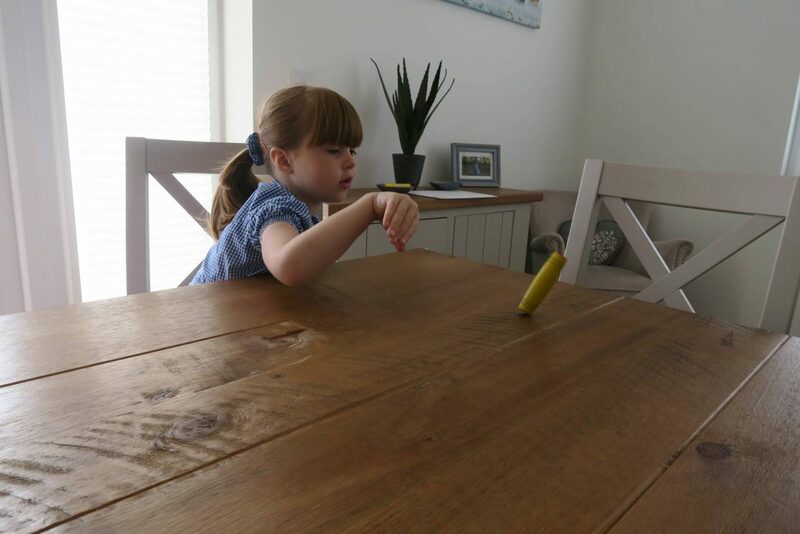 I was surprised by her level of concentration to get it to work. Another easier trick to try is to do a basic flip. To do this you need to flip the MOKURU over and stop it with a flat hand in a vertical position. Bless Alice I think her hands were a little bit too small to master this one! And the happiness when you can do it! Whilst this may have kept Alice amused for a while, it is noisy as the MOKURU is made of wood and kept banging on my table! The MOKURU is small enough to fit in a pocket or a purse and can go anywhere. It’s a new game for kids to play in the playground, and I’m sure big kids will love it too! Players can refine their techniques until they become a MOKURU master…I think we are a long way from this! It is available in a range of colours and it is available to buy at Smyth’s Toys, RRP £9.99. Disclosure: We were sent our MOKURU for the purpose of this review. All views and opinions are my own. This sounds fascinating – although a bit daunting! I’m not sure I’d have the skill! Well done Alice though, I love her huge smile when she managed it! Such a great way to teach kids how to persevere with something. Wow, this sounds very good. I have seen a few of these about and would love to try one out though…Would be great for my daughter! Eek, I think the noise would drive me a bit mad! I might invest in some fidget spinners though, they sound great for entertaining them in the car without tech. I have been very unsure of these fidget spinners but this new take on it sounds fasciating and I think my youngest would love it. Would you say that it helps with concentration then? These look just as addictive!! Great review Alice, we love fidget spinners, so I am pretty sure Fred would like this too. I saw these last week and wondered what you did to make them “work”. It looks like you really need to master the knack of it, but Alice looks so happy with it! I’m trying to shield my children from these, we have enough going on with fidget spinners! This sounds like a lot of fun! They’ve not made it to our kids schools, yet. At the moment the craze seems to be Crazy Aaron’s putty!